The Brexit chasm has seemed unbridgeable. No path has appeared through the impasse. On Thursday, a glimmer of a route came into view. Parliament decided to ask the EU to postpone Brexit day and extend the negotiating phase, probably for three months. It asked for this phase to be extended, probably for three months. It did so, shamelessly, because it could not agree on what on earth to do next. The EU, reasonably, asks why. If the UK could not decide on Brexit in two and a half years, what difference will three months make? The answer is that Theresa May is refusing to give up on her red lines and her frantic efforts to appease the right-wing of her party. Yet her deal has not so far pleased them, and it has now gone down to defeat twice, by huge margins. Astonishingly, she wants to try one more time next Tuesday. May hopes that she can bully, bribe or even persuade a few more of her Tory MPs to change their minds. Even if she wins over the DUP, this is near inconceivable. I attended the anti-Brexit Bruges Group rally last Monday, and can report that these people will never support her deal. They would no more strike a bargain with Brussels than vote that the Earth is round. 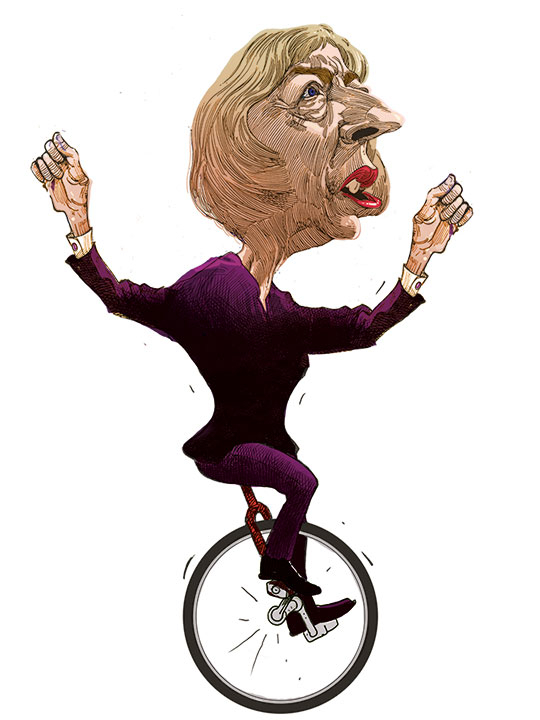 Even if May wins, she will return to Brussels an unstable leader. She has an insecure majority, an undisciplinable cabinet and an alienated opposition. She could hardly go forward into the final negotiating phase on that basis. Her “opening to the right” two years ago has been as disastrous to herself as to the country, as are all such attempts to govern in a democracy from the extremes. Last Wednesday, the Commons came within two votes of seizing control of the Brexit process from Downing Street. The price May had to pay to secure her narrow win was to agree that, if she loses again on Tuesday, there will be time set aside to debate how the house wishes to honour Britain’s commitment to withdraw from the EU, given that by then it will have vetoed both her deal and no deal. In other words, parliament will have an opportunity to cohere round an alternative to crashing out of the EU without any deal at all. It remains astonishing that it has taken so long for this pathetic Commons to come near such an initiative. The question for May will be: can she still keep hold of the process? She really must accept that her red lines and the appeasement of her right-wing have failed to pass muster. She must be ready to allow her chancellor, Philip Hammond, to live up to his remarks on Wednesday favouring a cross-party compromise. This means he must join in serious talks with his Labour shadow, John McDonnell, and with Jeremy Corbyn, both of whom have clearly indicated a willingness to seek an alternative Brexit deal. That alternative is now clear, not least since the Commons rejected a second referendum. That option would have breached faith with the 2016 vote. It would have repolarised debate and been a gift to Brexit fanatics. The time for a second referendum is way down the line, possibly to confirm a final, permanent deal. The sensible compromise is clear: soft Brexit. It is variously code-named common market 2.0, or Norway, or customs union, or EEA. Under it, Britain leaves the EU but remains in Europe’s wider economic zone. Such an off-the-shelf package is known to be acceptable to Brussels. It respects the pleas of industry and commerce not to wreck Britain’s continental trade for pie-in-the-sky “deals with the rest of the world”. A customs union (plus or minus) would resolve the insoluble Irish border issue. It would avoid a tariff at Dover and save British farming its present horrors. The single market would also avert the absurdity of replacing Polish workers with those from halfway around the world. Soft Brexit may not please everyone, but it is now the nearest to a Brexit common denominator. The essence of compromise is to find a way through intransigences. This is politics, not a war of religions. If May refuses to authorise cross-party talks— thus giving Brussels a reason to agree a delay — she has no alternative. Britain crashes out of the EU in two weeks’ time. No-deal Brexit scare stories may have been overstated, but crashing out would devastate the jobs and futures of tens of thousands of people, and hugely disrupt the economy. The best news on Wednesday was ostensibly the worst, the crumbling of discipline within May’s cabinet. It must make sense for Hammond and dissident colleagues such as Amber Rudd and Greg Clark to find common cause with the backbenchers Sir Oliver Letwin, Nick Boles and Dominic Grieve. It must be sensible for them to collude with Labour’s Corbyn and McDonnell as well the backbenchers Yvette Cooper and Stephen Kinnock. Just now, they are the regiment of the sane. So far, the Commons has glaringly lacked either the competence or the chemistry to fashion compromise. It is good at feuding, twisting, turning and postponing. It can kick cans down the road all night, but it cannot decide. This week, as a nation screamed for compromise, it had to witness a burlesque of ranting backbenchers, helpless ministers, “incandescent” whips and negative vote after negative vote, none to any constructive purpose. On the BBC’s Newsnight on Wednesday, all four sides — there now seem to be four — ended up shouting incoherently together as the curtain closed on them. A national emergency reduced to pantomime. Britain’s Commons can never again trumpet itself as the “mother of parliaments”. It is more an old bag lady mumbling oaths on a street corner. The reason is that it is still enacting procedures designed for the polarised tribalism of the 18th century. It ritualises partisanship and disagreement. It dares not unite. This is how nations drift to war. Their leaders strut the corridors of power, puffing up their chests and calling down the wrath of deities on their foes. Verbal knives outnumber handshakes. It is no longer only May and her deal that are on trial. So too is the House of Commons, and whether it is any longer a useful adjunct to responsible government. When Britain is out of this mess, parliament must reform. It should use its impending exile from the Palace of Westminster to galvanise its future as a legislature. It should leave London for a while and immerse itself in the provinces. It should find a voting system that better reflects popular opinion. The bloated House of Lords should be replaced. A fairer balance is needed between England and the UK’s other nations. Only then will this farrago have served some purpose. As it is, Britain must this weekend await enough MPs with the guts to cross the bridge of compromise. Nothing else will do. Simon Jenkins is a Guardian columnist.